We create best-in-class multimedia content, including medical animations, medical illustrations, and interactive graphics through a time-tested collaborative process. Our experience with a wide range of clients includes creation of medical multimedia owned by our customer, modification of our existing library of medical animations and multimedia content, licensing education content from our animation library, and integration of unique patient point-of-care and lifestyle modification applications. "Engaging patient education through animation and other multi-media content improves patient understanding, retention and engagement"
By using multimedia and animation, you can present complex ideas in a format that is easy for consumers to understand. To learn more about improving the patient experience through engaging patient education content review our white paper, which is a retrospective review of academic literature confirming that the multimedia and 3D animation content we produce is superior to commonly-used text-based and pictorial education content. Visual Health Solutions enhances the patient experience leading to improved outcomes by engaging the patient and their family so the entire support network understands the treatment plan and can make better decisions about the patient’s personal health. Our medical animations and multimedia medical productions shine a light on complex health information in a way that's impossible to convey by conventional means. Visual Health Solutions provides visual communication solutions for healthcare providers, clinical professionals, patients, and pharmaceutical and medical device companies. A look at our work, including medical animations, interactive media, and mobile applications. Medical device animations highlight your products and demonstrate how they work. Pharmaceutical mechanism of action animations portray information in a format that’s both beautiful and easy to understand. 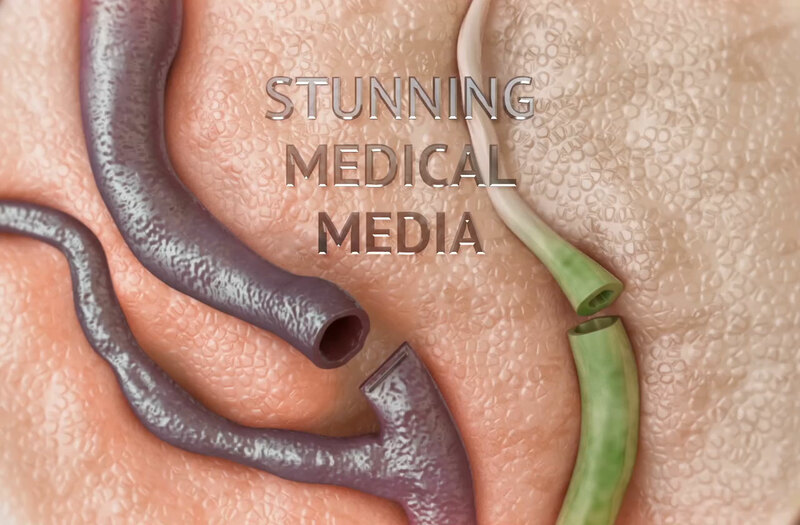 Learn more about us and the medical animations and multimedia programs we create. The Visual Consult is a clinician / patient communication application that engages patients while talking with their clinician at any point of care — in the exam room, during conversations with a nurse or PA, at discharge, or at the pharmacy. Our content and platform are unrivaled in their accuracy, aesthetics and impact with patients and clinicians. Additionally, the Visual Consult saves healthcare providers time, documents the conversation and reduces risk through superior informed consent. Body morphing application development is one of our specialties. Visualize You is a powerful motivational tool for people trying to lose weight. Our software engineering and creative team can approach many elements of risk modification the same way-allowing patients or customers to see what they will look like if they change a behavior be it smoking, reduction of sun exposure, use of sunscreen, change in diet, exercise regime change, etc. Visual Health Solutions Body is an interactive visual tool of the entire male and female human bodies, allowing users to explore the body in 3D. With easy-to-use navigation, users can search multiple layers of the human anatomy, view systems and organs down to their smallest parts, and understand in detail how the human body works. Visual Health Solutions has developed a multimedia education library of medical conditions, clinical procedures and treatments, and anatomy. Our medical animations and programs promote health understanding in a way that's impossible to convey through traditional text-based content. Medical animations, video and medical illustrations are an effective tool in the courtroom, making complex medical issues easier to understand. Subscribing to Visual Health Solutions' medical library provides access to hundreds of "off-the-shelf" procedures, anatomy visuals, and concepts for depositions, settlement conferences, and trials. As cases progress, the graphics can be customized to represent case specific circumstances. From branding new products to product launch strategy, sales training and support materials, we have key employees with decades of experience in the medical device, EMR, telemedicine and healthcare policy arenas. We do so much more than create the best medical images around; we add our sales and marketing team to yours to help you sell. In Colorado, the sky is the limit. It is open and boundless. That is our culture - honest and energetic, combining creative genius with decades of healthcare expertise. Mr. Baker brings more than 30 years of management, financial and investment banking experience to Visual Health Solutions. As the CEO of Visual Health Solutions, a position he has held for almost a decade, Mr. Baker has guided the company through explosive growth including doubling the staff, profitability, and product expansion beyond human anatomy to include programs on bioterrorism, animals, and dentistry. Prior to joining Visual Health Solutions, Mr. Baker was a partner and founder of Shenkin, Kurtz, Baker & Co., P.C., a premier regional tax planning and consulting firm. Mr. Baker's professional career began with PriceWaterhouseCoopers, a Big 4 accounting firm. Mr. Baker graduated in 1973 from the University of Colorado with a BS in Accounting. Under his direction, VP has increased the depth and breadth of its product base and developed strategic alliances with publishers, pharmaceutical companies, and other health and medical clients. Gretchen Gramling is a skilled multimedia producer who has spent over a decade working in the medical communications industry. She blends her exceptional attention to detail, organizational skills and creativity to effectively coordinate the production of medical writers, illustrators, developers, animators, and designers to ensure projects meet the creative and strategic goals of the client. With enthusiasm and a hands-on approach, Gretchen works with the production team to exceed expectations and provide clients with what they need on time and within budget. Gretchen has a BS in Business from Colorado State University. When she is not in the office, Gretchen is usually enjoying the Colorado outdoors with her husband and two daughters, cheering on the Denver Broncos, or looking for something chocolate. Michael has spent more than 10 years designing in both print and digital media. His varied professional experience includes working in design studios and advertising agencies in Colorado and El Salvador. Michael joined Visual Health Solutions in 2004 and is responsible for interface and content design in a variety of multi-media formats. He earned a Bachelor of Science degree in both Graphic Design and Illustration from John Brown University. Danny has over 10 years of experience in biological animation and illustration. Danny received his Bachelors of Fine Arts from the Columbus College of Art and Design and his Masters of Fine Arts from the University of Michigan where he was an Adjunct Professor. Danny joined Visual Health Solutions in 2003 and is responsible for all aspects of 3D visual storytelling, both technical and artistic. Josh joined the animation department at Visual Health Solutions in 2004. He holds a Master of Science in Medical Illustration from the Medical College of Georgia. He works with the creative director and the other animators to ensure that all animation work achieves our high standard for quality, while still meeting all deadlines.